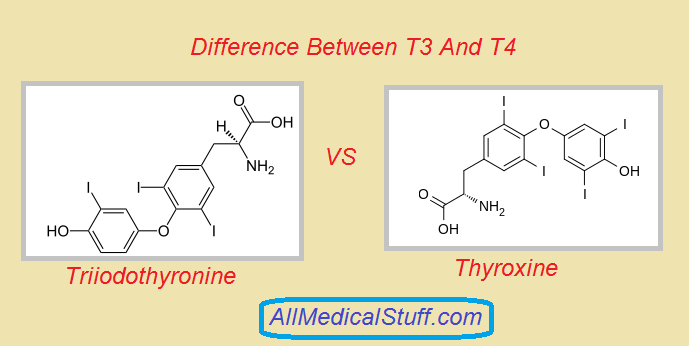 To have some idea of thyroxine and triiodothyronine, you must know the process of formation of both of these hormones. First of all iodine enter thyroid. This occurs by active transport through Sodium iodide symporter. This is facilitated by TSH (thyroid stimulation hormone) which is released by hypothalamus. After entrapping, iodide is converted into organic iodide by the action of peroxidase. Then tyrosine (which is present in thyroglobulin) is converted to mono and di iodo tyrsoine i.e MIT and DIT. It is called iodination of thyrosine. This reaction is also catalyzed by thyroid peroxidase enzyme. After this two DIT combine to form T4 and one MIT and one DIT combine to form T3. When required, T3 and T4 are broken from thyroglobulin and released into blood by the action of protease enzyme. T3 is formed by DIT Plus MIT. Whereas T4 (tyroxine) is formed by combination of two DIT. T3 has relatively rapid onset of action while T4 has slow onset of action. T3 has short duration of action as compared to t4. T3 has less half life as compared to t4. i.e the half life of t3 is about 1 day and that of t4 is about 7 days. 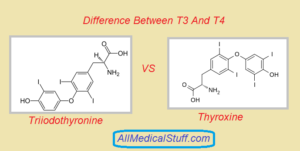 Triiodothyronine is more potent than thyroxine. T3 is used to treat myxoedema coma. While t4 is used to treat both myxoedema coma and regular treatment of myxoedema. T4 is converted to T3 in target cells while T3 is not converted.